Crimson and navy and gold. 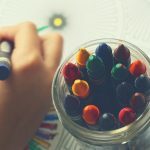 Bright bold primary colors fill the room. Balloons glinting, ribbons curling, paper lanterns swaying, silk shimmering, glitter sparkling. Soft white roses and red felt apples are scattered about. A little girl with a red bow in her dark hair dashes by. Her rosy cheeks match the checks of the Snow White figure balloon bobbing over her head. A blue banner swaying lightly in the air describes her perfectly in this moment: “Stella is the fairest one of all”. Her little red cape matches the big red cape draped around the shoulders of the prince, played by her daddy. 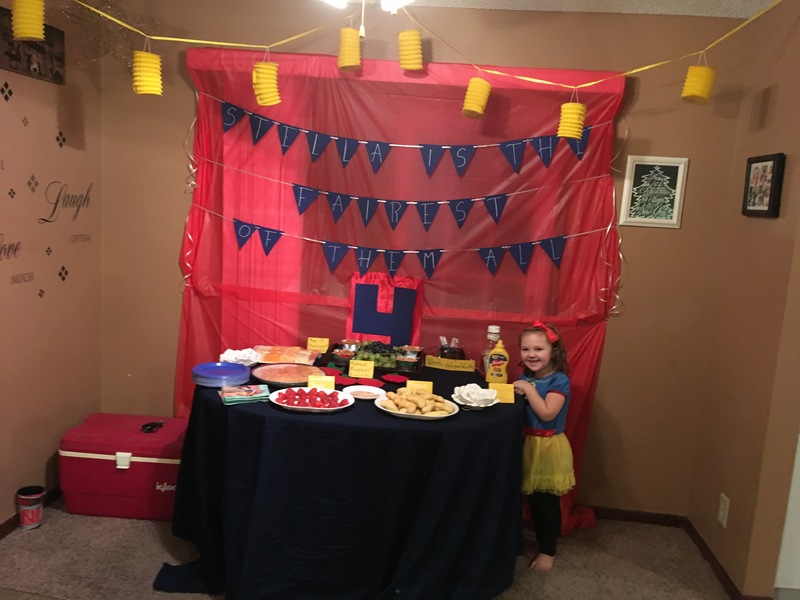 She wants a picture with him in front of the birthday display with the number “4” behind them. 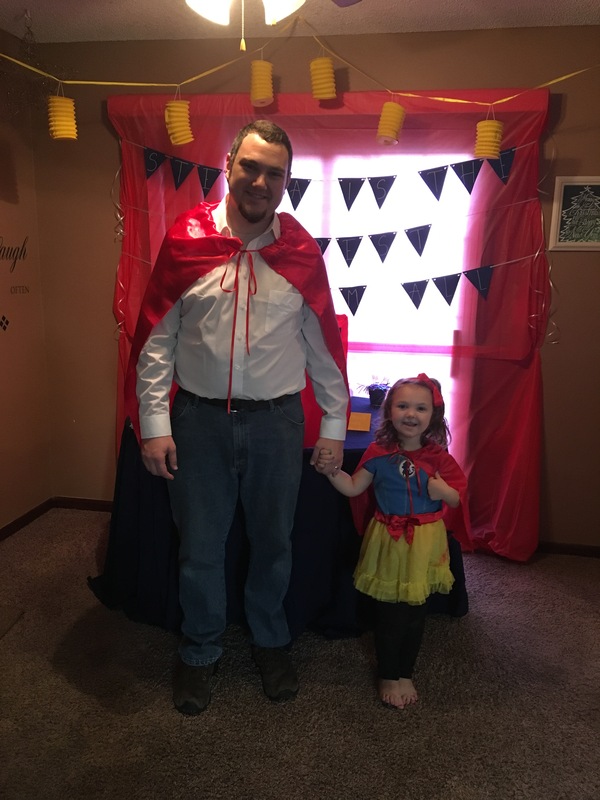 He is Prince Ferdinand and she is Snow White in the glorious imaginative world that a four-year-old is privileged to know. 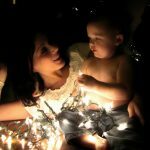 And this is the special birthday night she and her big sister have been talking about for months and her mom has been planning for weeks. It’s all coming together after hours of planning and prepping. 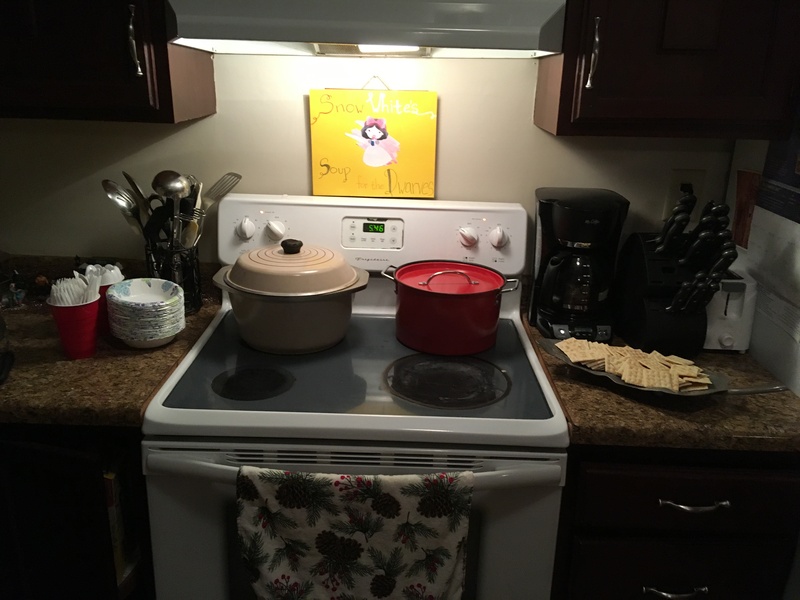 The only major disaster being the double batch of party soup that burned and had to be remade. 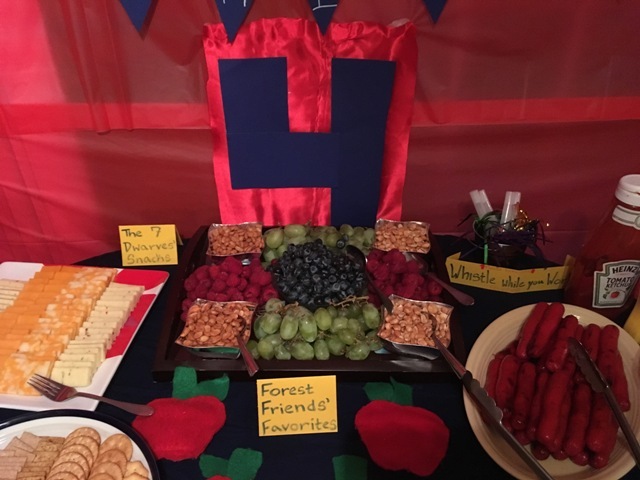 But the party planning committee (aka mom) prevailed and in a last flurry of activity, the food is ready and displayed. 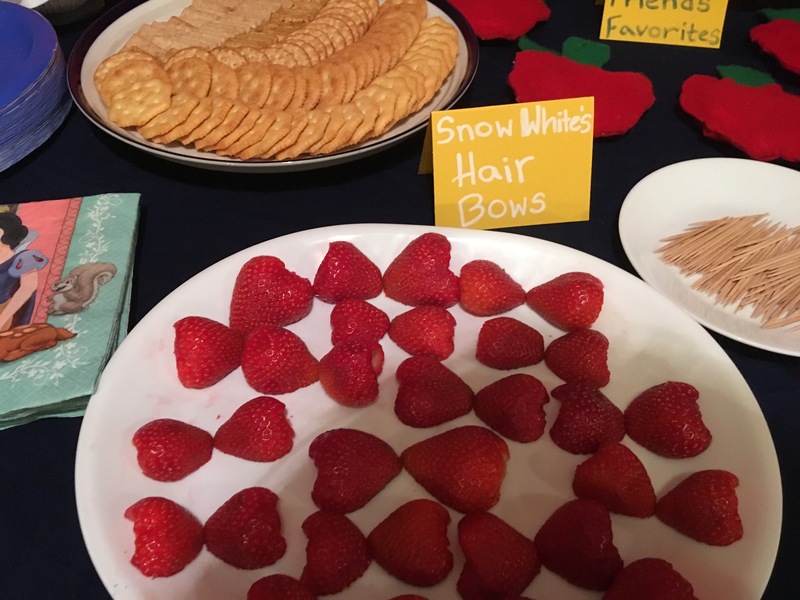 Fresh berries are gathered in juicy clumps, strawberries, cheeses, and biscuits are arranged in tidy rows, soup is stirred on the stove, and punch is mixed to a sparkling finish. The party is about to begin and there is a little princess who couldn’t be more thrilled. 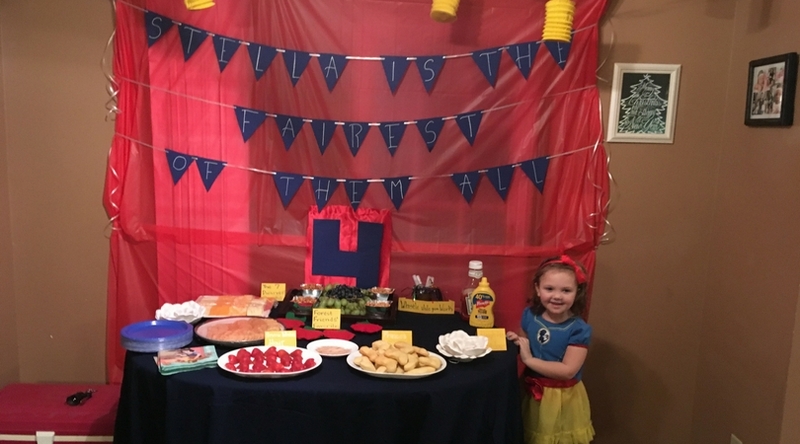 Here are all the details on the party so you can plan one for your own little Snow White. 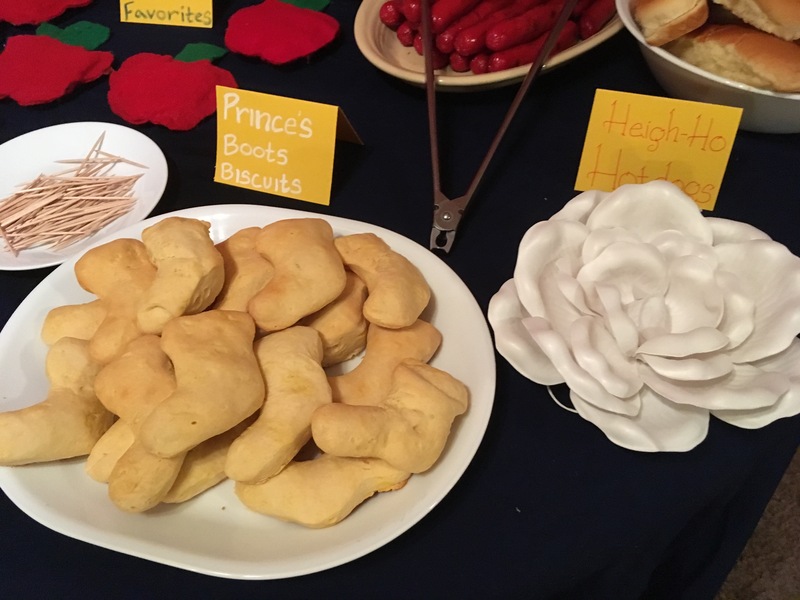 There was only limited resources for this on Pinterest so a lot of these ideas I came up with on my own by trying to incorporate phrases and characters from the Snow White movie. For party invitations, I purchased these adorable ones from Etsy. 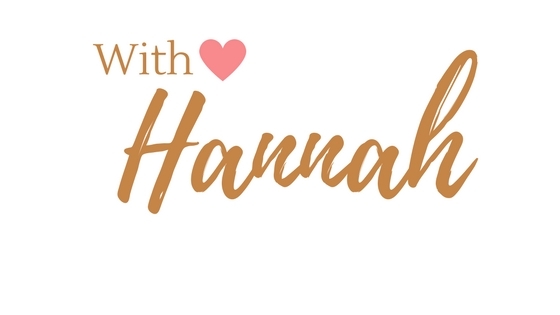 I opted to just do picture thank you notes this year which means I print out a picture of the birthday girl at her birthday display table and write quick thank you notes on the back of each picture. +Snow White’s Soup for the Dwarves. You can make any kind of soup but we opted for two kinds. Vegetable Beef Stew and Chicken Bacon Ranch Chowder with saltine crackers. 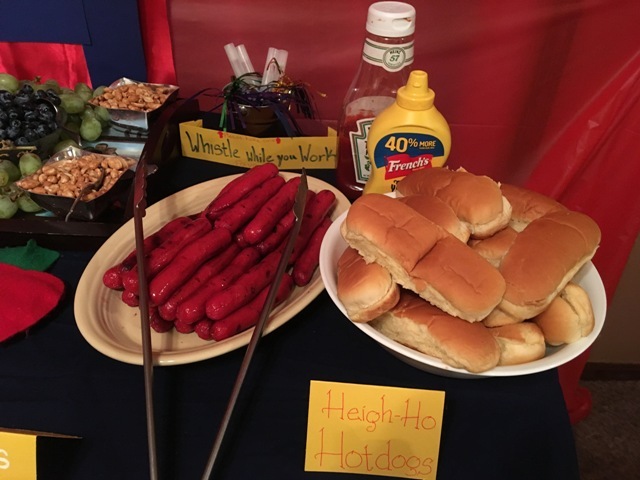 +Heigh-Ho Hotdogs. 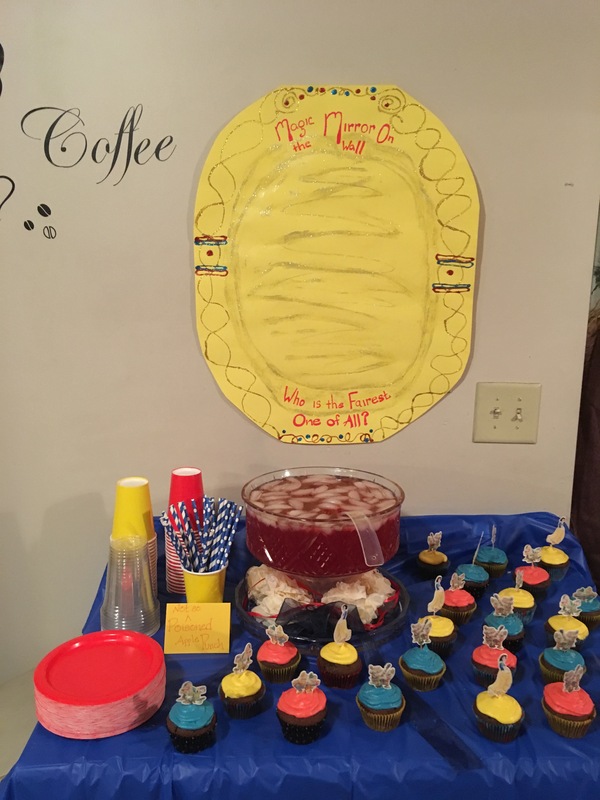 Just basic hot dogs and buns with ketchup and mustard. Ideal for kids who may not enjoy soup. +The 7 Dwarves Snacks. Sliced cheeses and crackers on a tray, offer a variety that your guest will enjoy. +Forest Friends’ Favorites. 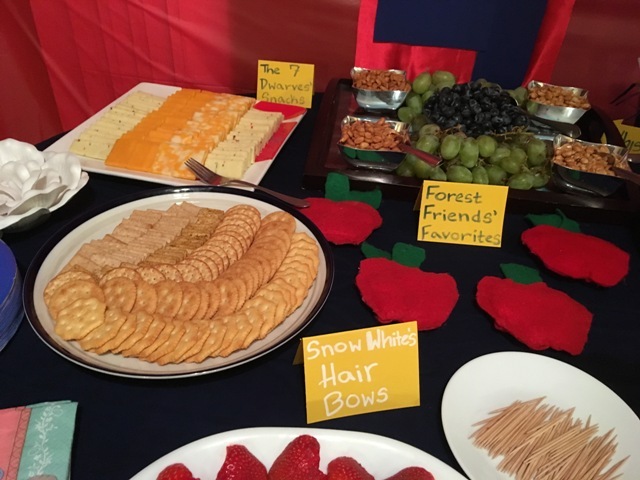 Berries and nuts that would appeal to Snow White’s animal friends she meets in the forest. You could do any selection for these. I choose grapes, blueberries, raspberries and flavored peanuts. +Prince’s Boots Biscuits. Pillsbury biscuit dough rolled out and cut into the shape of a boot using a boot cookie cutter. +Snow White’s Hair Bows. Strawberries halved and arranged to look like miniature bows. 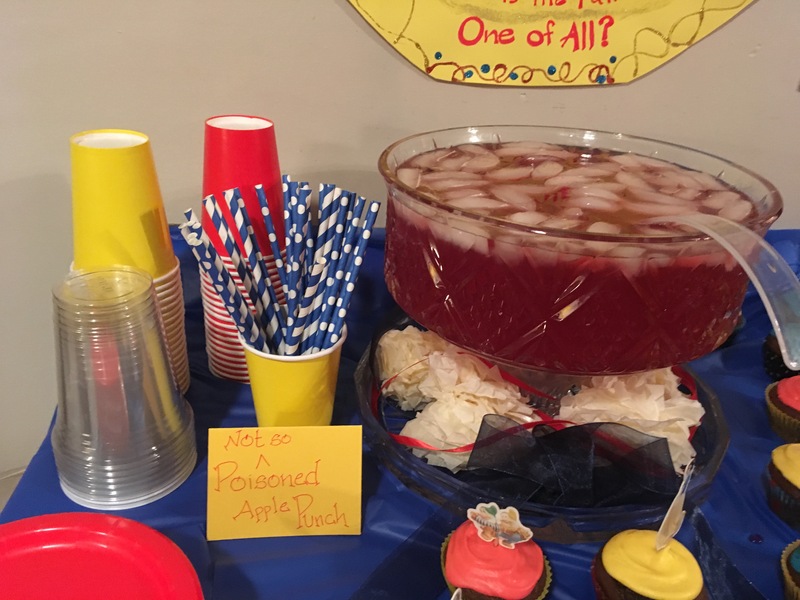 +Not so Poisoned Apple Punch. Equal parts apple raspberry juice, cranberry juice, sprite, and a splash of lemon juice. Mix and top with ice. 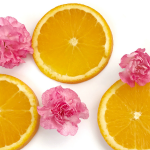 If you want to get fancy, you can go with this recipe. +Snow White Cupcakes. Chocolate cupcake with blue, red and yellow frosting, topped with Snow White cupcake toppers. 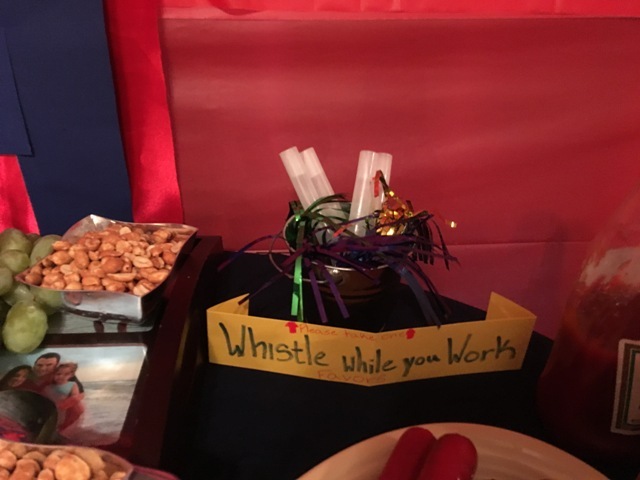 “Whistle While You Work” Whistles in honor of the dwarves song in the Snow White movie. I just bought party whistles and displayed them in a tin pail. 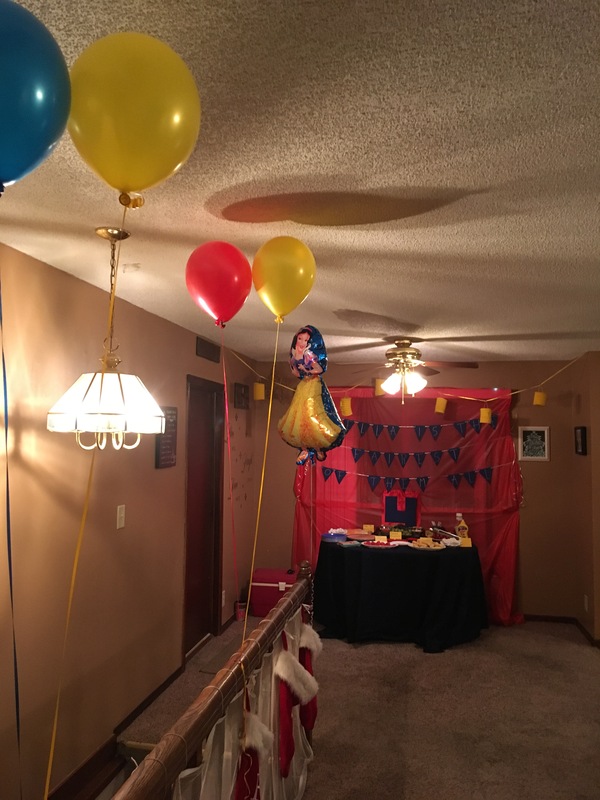 I went with red, blue and yellow for the party colors to mimic the colors of Snow White’s outfit. 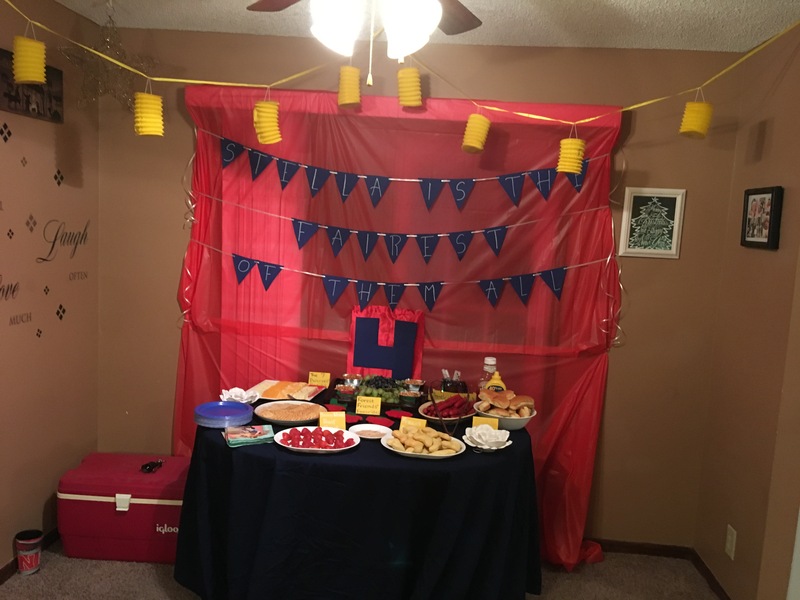 I used plastic tablecloths from Walmart to both decorate the tables and to create the backdrop for the food table. I ordered balloons from party city to match. The Snow White balloon I purchased from Amazon and then had Party City fill it with helium for just a few dollars. That was one of Stella’s favorite parts of the party. 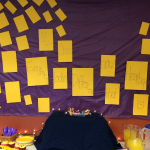 I strung yellow lanterns across the ceiling and placed felt apples and white roses on the food table. 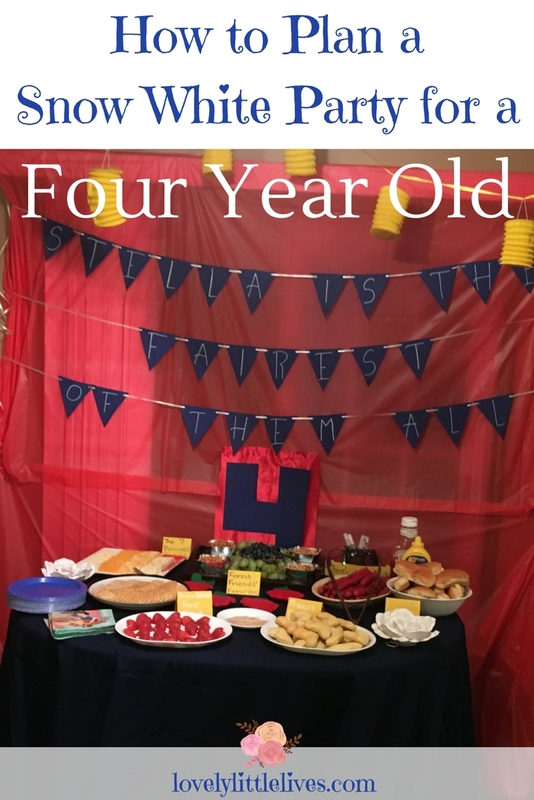 The apples were actually from a previous birthday party and the roses were from Hobby Lobby. I created a banner that read: “Stella is the fairest of them all” using blue cardstock cut into triangles and strung together with white ribbon. I cut the number “4” out of the leftover cardstock and attached it to a piece of red silk I had leftover from the red capes I made. I used thumbtacks and clear mailing tape to hang everything. 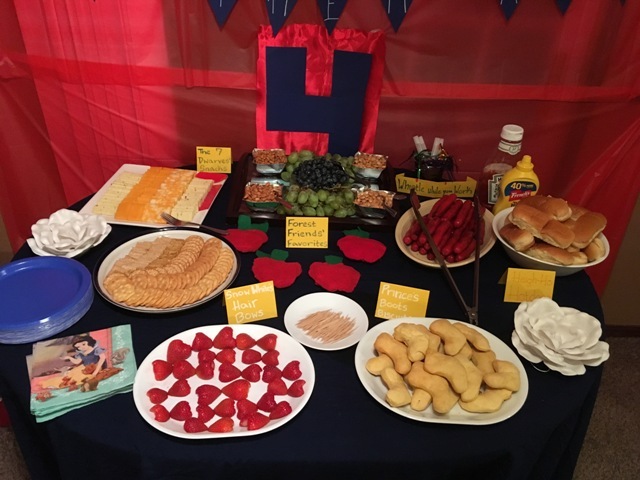 The food table was draped with a blue sheet and I created signs for the themed food just using folded yellow cardstock and markers. I made a bigger sign to hang over the stove where the soup was keeping warm. 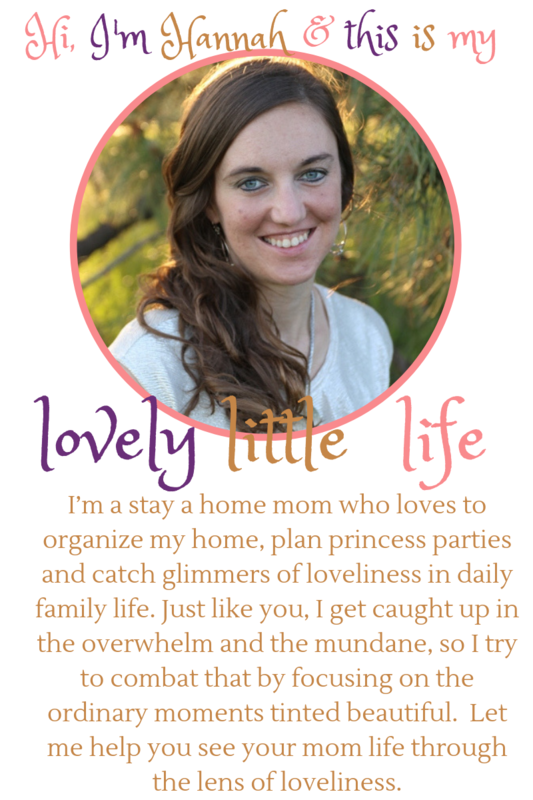 The Snow White drawing was cut out form this free princess calendar. 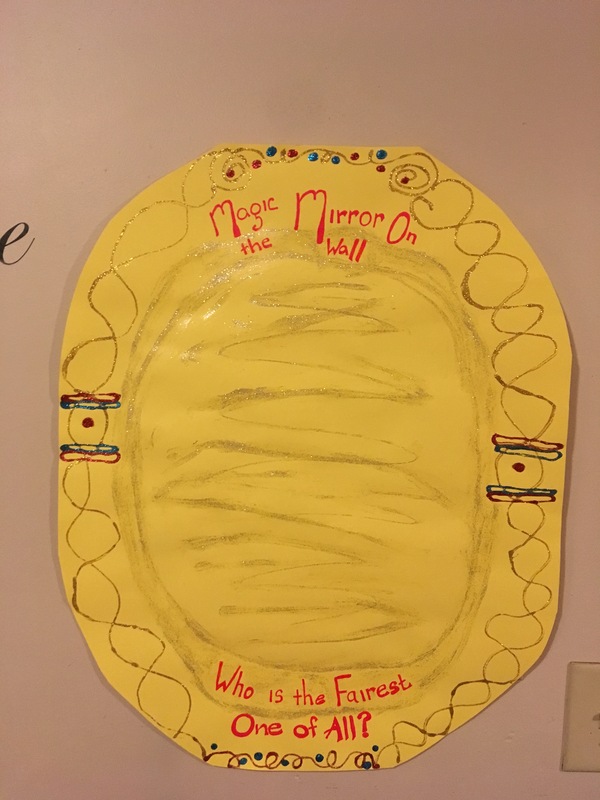 I created a “Magic Mirror” like the one in Snow White with yellow cardstock cut into an overall shape and glitter glue to decorate it with a Snow White movie quote. I saved this piece after the party to hang in my daughters’ princess room. 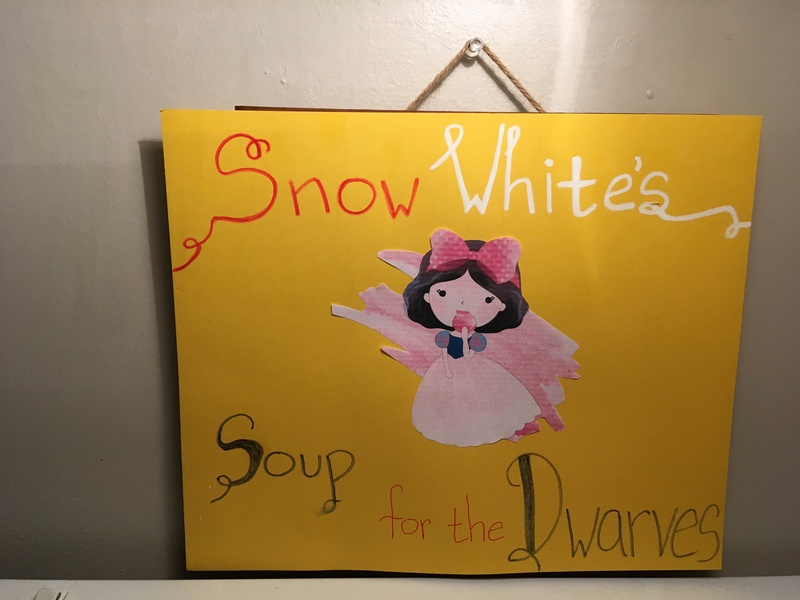 To go along with the color theme I purchased red and yellow cups, blue plates and straws, white bowls and silverware and these festive Snow White napkins. To complete the theme, we all did a little family dressing up. Stella was of course Snow White. I got her a red bow headband to wear and a Snow White dress secondhand. There are some similar ones on Amazon. I bought red silk, red ribbon and fabric glue from Walmart and created simple capes for both the birthday girl and Daddy. Daddy the prince wore jeans and a white shirt to resemble Snow White’s prince. 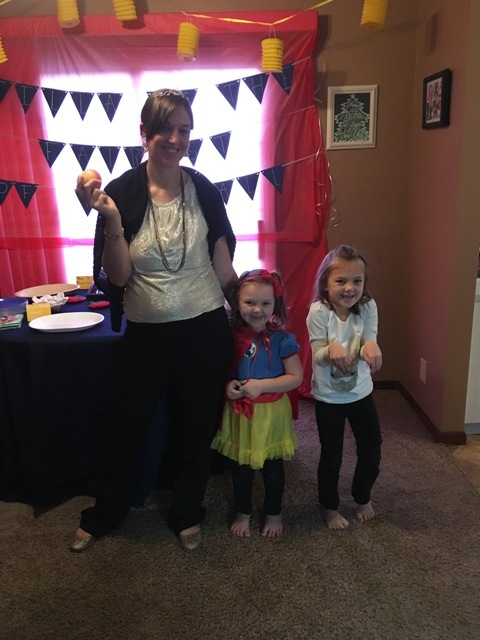 I was supposed to be the “Evil Queen” which meant I wore gold and black with the tiara from my wedding day and I posed for the picture with a “poisoned apple”. Heather, our oldest, was a deer from the forest just like Snow White’s Forest Friends. She wore a shirt that she already had that just happened to have a pretty deer on it. 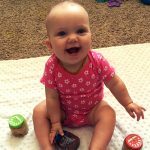 We had the Snow White movie soundtrack playing in the background and a picture slideshow of all of Stella’s pictures from the past year. 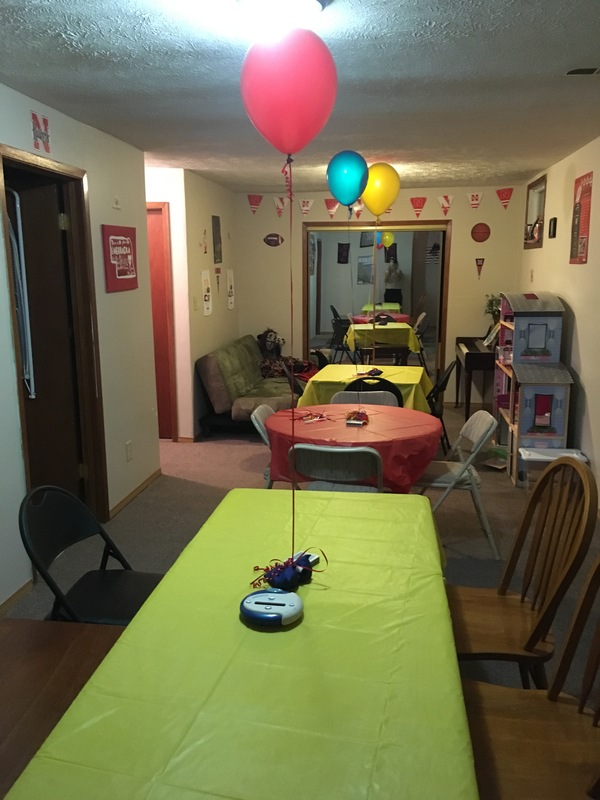 We had about 30 guests attend and everyone had a wonderful time, most of all the birthday girl. Her favorite gifts were a new puppy dog and a book of fairytale stories. If you have any questions about the party or any of the details I might not have explained, please leave me a comment below! 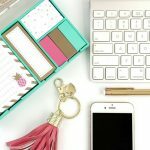 Thanks for reading and happy party planning!